A Mr Hall visited Filey Ladies Monday club, in 1990 approx. he gave a most interesting talk on the making of the new sea wall and Royal Parade. 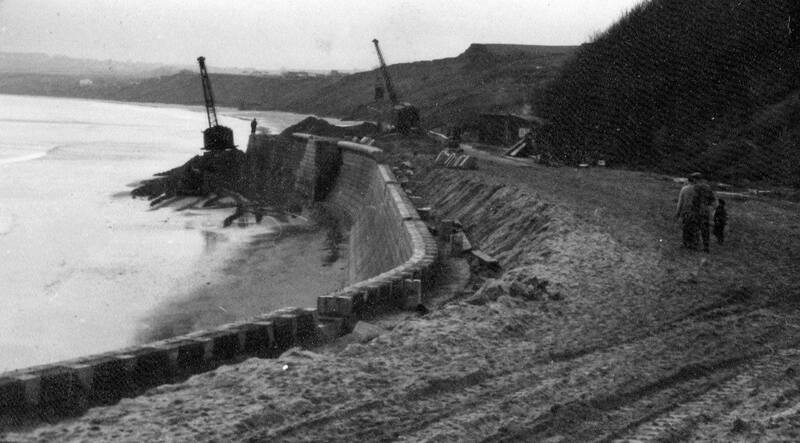 In 1955 Mr. Hall worked for Dews of Oldham who were the contractors for the new sea wall , he came from Bradford , and the work was carried out by Fairbank& son . Filey Council passed the plans; the rumour was that it was not felt necessary for Filey to have this money after the great storm of 1953, as there was hardly any damage as such. A compound was made on West Avenue car park , it was such a set up that in its year of service 25,000 concrete blocks were made for the sea wall , also the mass of concrete for infill behind it .The cement was taken to the sea front by wartime lorries top speed 30 miles an hour , there route was via West Avenue down southdene then Crescent hill . Liquid concrete was mixed at the compound and taken in metal skips to the seafront, then taken off by cranes and dropped into tanks at the bottom of the foundations; these acted rather like a preformed and were moved along each day as the concrete set. Most of the labour was local but mainly from Scarborough, the only Filey men that worked at the compound were Mr. Boynton and Mr. Cowling, men at the compound had nothing to do with the men on the beach. Work started on a Bank holiday which made the firm really popular, but it drew many folk to sights ee, it was a very rough time weather wise, Two other projects were also happening that year the big sewer was put along the side of the brig, but these contractors were not too good, they lost seven sets of machinery to the sea, Mr Fairbank lost nothing. They had a great big steam driven pile driver that was parked, on the now, paddling pool, which locals hated this was driven by a man that believed to have sailed trawlers all over the world, but all he could get this thing to do was billow thick black smoke all over Filey, much to Fileys disgust. The night before the celebration Mr Hall was called out to strengthen the underneath where the deckchairs were kept because Mr. Fairbank of Fairbank & Son thought it would collapse and injure lots of people, so he had a hard night and got up late for the celebrations. 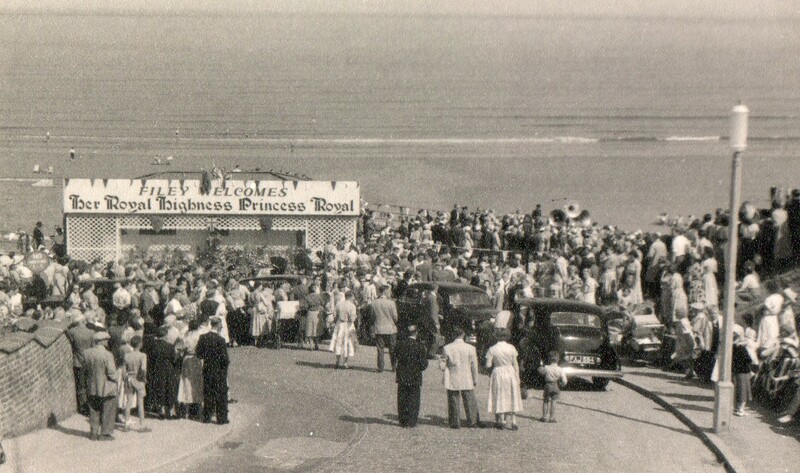 On completion The Princess Royal came to open the new foreshore, and attended the celebration tea, the silver for this was brought up from London; the tea took place at the Royal crescent Hotel.